If dirty coolant machined better, no one would ever dump it. Removing the tramp oil from the coolant offers dramatically increased tool life, improved parts finish and reduced new coolant purchases. Our flagship unit for removing tramp oil. Designed as dedicated systems, these units can be floor mounted or magnetically mounted to the machine tool. Over 10,000 in the field. All units employ our patented oil coalescing package and rugged 1⁄2” air diaphragm pumps. 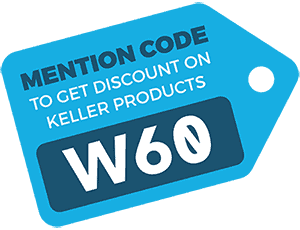 Keller Products units set the industry standard for offering the best value in the market. Our combination of durability, performance, and cost is unrivaled. Our tramp oil coalescers are easy to set up in minutes and require minimal operator attention. All units can ship via UPS. 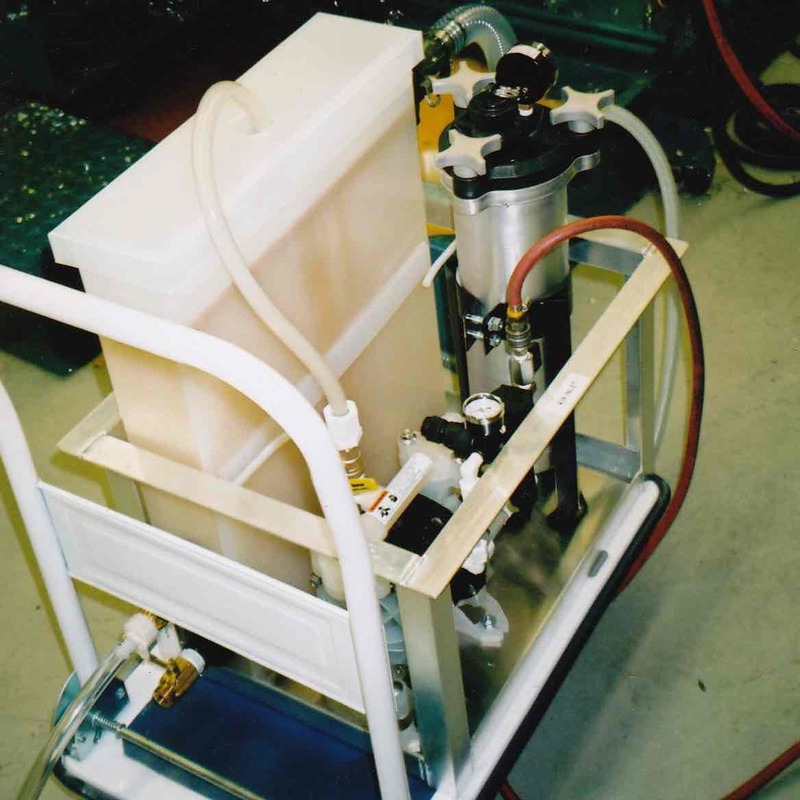 Our portable tramp oil separators have set the standard in the industry for over 25 years. With Four models to choose from, we can closely match your requirements to a specific unit. All units employ bag filters for solids removal, rugged 1⁄2” air diaphragm pumps, and our patented oil coalescing package. Our belt skimmer package for removing tramp oil. 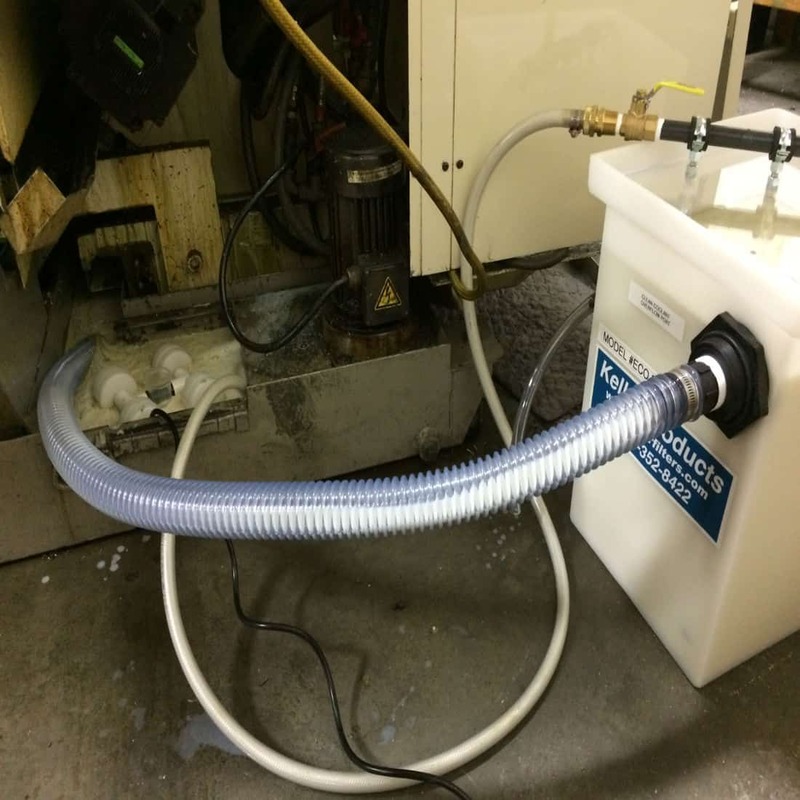 Eliminates two classic problems with conventional skimmers; excess coolant removal and overflowing collection tanks. Includes magnetic mounting bracket for easy installation. Our cost-effective oil skimming units for removing free oil from aqueous cleaning systems. 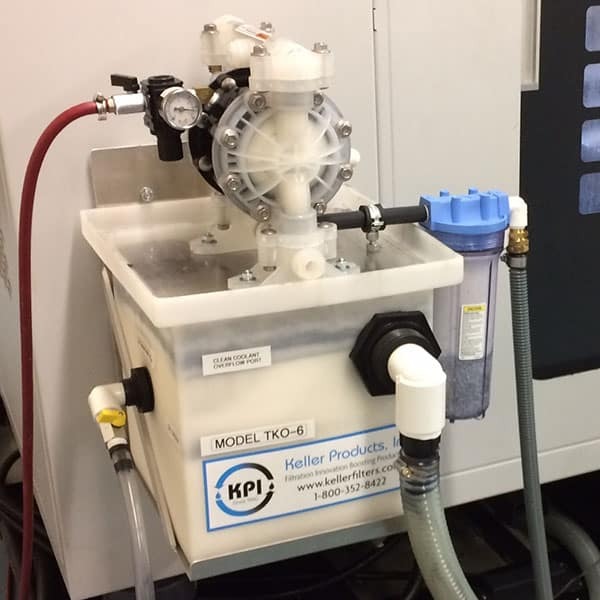 All units employ our patented oil coalescing package and rugged 1⁄2” air diaphragm pumps. 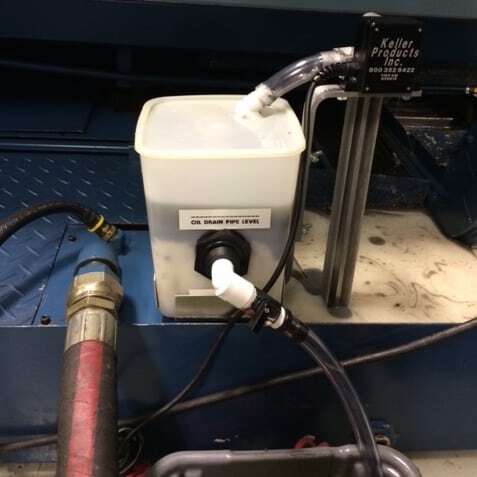 Our economical solution for tramp oil removal from individual machine sumps. Our tramp oil separators are easy to set up in minutes and require minimal operator attention. All units can ship via UPS. Tramp oil and solids constitute the standard contaminants which can foul metalworking fluids utilized in the machining process. Tramp oil is a general term used to describe free oil introduced to the coolant. This can occur via the lubrication system on the machine tool. These oils can include way oil, hydraulic oil, and spindle oils. Tramp oil can also be introduced by the metal being machined. This typically involves rust inhibitors on the raw stock rinsing off into the coolant. Tramp oil is also the term generally used to describe the free oil that accumulates as a by-product of the cleaning process in aqueous parts washers. Our TKO line of tramp oil separators are designed as dedicated units to be attached to an individual machine tool. They can be magnetically mounted to the side of the machine tool or positioned on the floor next to the CNC machine. Their performance can be augmented by adding bag filters and/or magnets for greater solids removal capabilities. Four different portable models to handle any shop requirement. All portable units include bag filters for filtration as low as 1 micron. Unique Black Magic belt skimmer package which magnetically mounts to the machine sump. Eliminates the classic problems of removing excess coolant, and overflowing collection containers. Click on one of the images above to view details on our tramp oil removal product ranges. 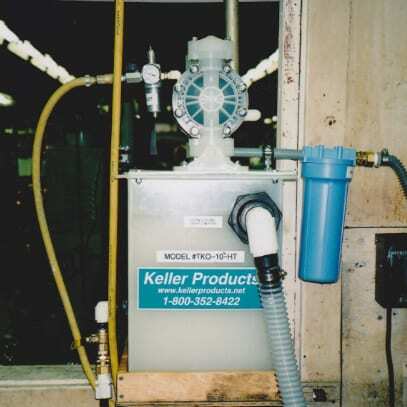 Click on one of the images above for further information, model information and specifications on Keller tramp oil removal products.